SDG awareness campaigns n activities - special focus on youth awareness - staff n students in schools, colleges to be aware, connect n work as SDG ambassadors! 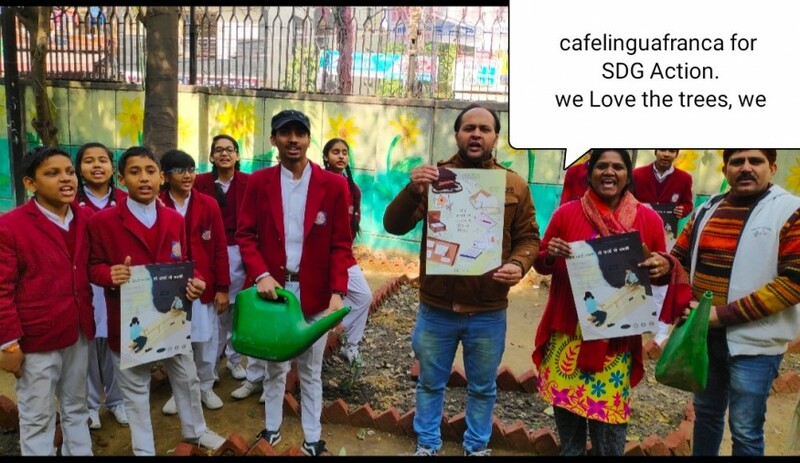 We started this mission cafelinguafranca for SDG Action with an aim to create widespread awareness and achievement of #SDGs by #UN which are basically the mantras to make the world, our planet better and more conducive to healthy living in harmony with the nature and a world with sustainable development. We target to spread SDG awareness among all age groups with special focus on youth awareness especially the students in schools and colleges to be connected and work as our SDG ambassadors, and their mobilization with focus on some major goals as Quality Education, Good Health and well being, sustainable cities, climate action, Zero Hunger, No Poverty, Life on Land and Partnerships through various activities and campaigns. Currently, we're operating in Delhi, India but with our widespread presence and influence on all major digital and social media platforms, we aim to spread the SDG awareness globally, forging partnerships and inspiring youth to achieve our goals of a sustainable world. The project started about an year ago and after a slow start gained momentum now. Innovation is our mantra and we constantly come up with innovative ideas for campaign and activities to connect youth like Word of the day morning assembly vocab revival campaign, English through Music, Drama, Budding Scientist for SDG Innovation SDG wall, Tag a Tree Buddy, Trek4SDGs already organized and many more to come. This has got us maximum impact for thousands of youth and has really proved instrumental as well as inspirational in bridging the gap between our mission and its execution through encouraging connect with youth and institutions and helped bring a positive transformation paving way forward for the realization of Sustainable Development Goals. So, Let's connect and work for UN's SDGs with us @ #cafelinguafranca - Explore, Educate and Enjoy! We are cafelinguafranca for SDG Action is a volunteer based initiative for innovative approach to realizing SDGs by Team of cafelinguafranca - a volunteer based non profit committed to SDGs and excellence in Education especially for the deprived and the underprivileged who have the will, skill motivation and potential through various creative activities and campaigns. We're working globally through social media connect but based at New Delhi, India.